Are You Building (Ad-Sales) Competitive Advantage? What is competitive advantage, and where does it come from? What would your business be like if you had some? How can you get some? Warren Buffett, the widely worshiped long-term investor, says he looks to invest in businesses with a “wide moat” that protects the business from competition; allowing them to charge higher prices than others, allowing them to achieve higher return on investment, and usually allowing them to survive down-turns more successfully than other businesses. The Coca Cola Company is one famous example of Buffett’s investments and an example of a business with competitive advantage. It starts with the quality of the product, but that is not enough. The distribution network maintains relationships that put the product everywhere, and advertising builds the brand that stands for the quality of the product. The combination of these things makes for the moat. The product quality is consistent and is only changed by evolving the packaging to be more convenient to fit changing lifestyles. The advertising is more productive, in part, because distribution relationships have put the product everywhere, so the customer can respond to the advertising more easily, leading to higher return on investment than competitors. So Coke can afford to spend more on advertising to keep the cycle going. The distribution network of stores and restaurants is loyal because they sell a higher-margin product and benefit from the advertising investment. For a media company, competitive advantage comes from these same core sources – quality, distribution and brand. As an advertising sales-driven publishing manager, how do quality, distribution and brand help you? First, by building the expertise of your ad-sales people and advertising services team, you build the quality-experience of the advertiser. You don’t over-sell the possible results: Your team knows how to manage expectations, and how to under-promise and over-deliver. Your advertising sales and customer-services team are coordinated to provide the best possible experience from order, to confirmation, to execution, to optimization, to final-wrap-up and reporting. Do you have a proper program to thank the customer for the business? This is the bridge between the “quality experience” and the “distribution-connections.” Have you thought about the fact that right after you publish advertising in your magazine or newspaper, on your cable system or your web site, your competitors will see it and attack you with a pitch to your customer that they have a better, or cheaper, or bigger offering? Second, you build your ‘distribution’ by developing and investing in relationships with many individuals at all levels of the advertising purchase and approval process. Of course, this applies to both customers and prospects. Third, you build your brand among current and potential future customers, reminding your current customers about the quality of your services and why they like your services, and seeding interest among potential customers. This marketing takes many forms – direct marketing, trade advertising, events, content marketing etc. 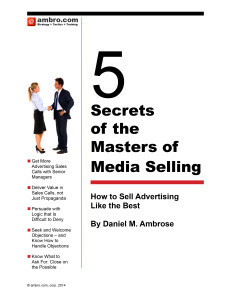 Marketing for ad-sales has the greatest ROI when it supports the first and second principles above. Do you gather and distribute market information that helps your customers have good “quality experiences” when they advertise? Does your marketing message-content provide value to your customers and prospects — your “distribution?” Are you providing them communications and information that re-affirms their purchase decisions an makes them think “I value my relationship with your company?” Are you conducting marketing that reminds keeps your company in the forefront of the minds of you ‘distribution’ so they’ll buy again at the next opportunity? If you view advertising sales as a purely transactional business, you won’t be building competitive advantage. When you invest in the three practices above your competitive advantage will build – one customer and one individual relationship at a time. Then, over time, your sales team will notice that they are more likely to get calls and emails returned and you win the close calls on business that might have gone to your competitor. You’ll win more renewal-business, meaning your new business wins can build the business rather than put you on a treadmill of win-lose-win-lose. Contact us if ambro.com can help you by auditing your systems to see how much traction your systems have in building advertising sales competitive advantage. ← Should You Sell Advertising to Women Differently Than to Men?